A very good quality, French copper, deep saute pan. This piece is marked, to the side, with a number '26' and three small star shapes. The number relates to the internal diameter of the pan in centimetres and the three stars would have been the mark of a previous owner for the purpose of identification. The pan is made from an exceptionally heavy gauge of copper. The copper in the sides of the pan nearly 4mm thick and it weighs about 6 kilos. 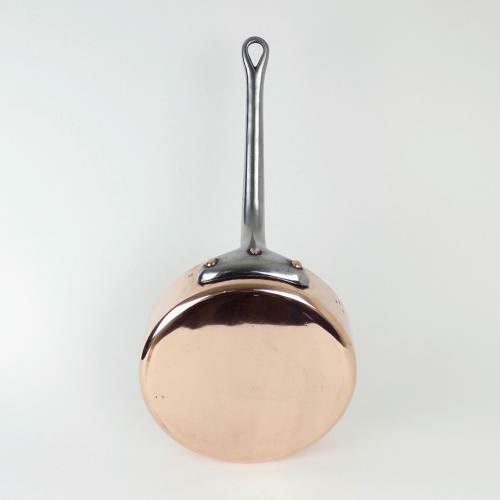 The copper has a very slightly planished finish and the pan has a steel handle which is a typical French shape. It dates from c.1880. The pan is in excellent condition. We have not had this piece re-tinned but the tinning is in very good, usable condition. The pan is 26.8cm. in diameter by 7.5cm. deep and the overall length of the pan and handle is 52.2cm. Price includes postage within the U.K. Shipping to the U.S.A. add £45. Western Europe add £15.